Mar 7, 2019 There are two resources we find ourselves recommending over and over. One is the awesome occupation exploration website, My Next Move, and the other is an insightful college readiness checklist for students and parents. My Next Move is a very friendly front-end to the comprehensive-but-harder-to-use federal occupations database, O*NET OnLine. You can explore jobs and careers easily and organically. The other transition resource is a college readiness checklist. If you have a college-bound high school senior, there are only a few more months of high school left. How can you help your student or child make the best use of that time? Jan 29, 2019 Find equipment for all ages available for loan, demonstration and reuse. 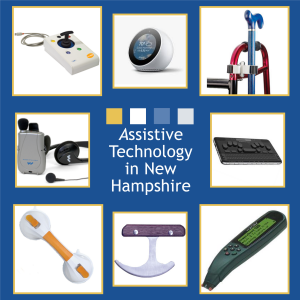 Assistive Technology in New Hampshire (ATinNH) has just unveiled their new online equipment database where you can browse at your leisure for needed devices. Create your profile and start browsing devices to request today! There is a video overview of how to use the site from a similar program in Idaho. ATinNH is a project of the UNH Institute on Disability and provides training, education, and outreach programming as well as equipment demonstrations, loans, and refurbishing. The Next Steps NH project provided professional development and coaching to selected New Hampshire high schools for the purpose of increasing the graduation rate of students with disabilities, and students at risk. This was done through implementing evidence-informed transition planning practices that helped students prepare for college, career, and adult life. This website was part of the project and housed all tools and resources developed as part of the project. The website is now supported by the NH Department of Education and managed at Keene State College. Transition: the process of assisting youth to move from high school to the adult world. College and Career Ready: having the skills, knowledge and abilities needed to enroll, persist, and succeed in college and other postsecondary training opportunities, and to gain entry into a meaningful career. Postsecondary: Elementary school is primary education, high school is secondary education, and after high school is postsecondary education.